For our CBEL project, our group’s main goal has been to increase awareness of Aboriginal medicinal and nutritional uses of traditional plants and to make the information regarding these plants more accessible. Many of these foods are less likely to be consumed by individuals living in urban centers simply because they may not know of the plants’ existence; we are hoping that our ethnobotanical database will spark the interest of many, both in the LFS community and beyond. Our latest activities consist of finishing and finalizing our database by adding to our plant profiles and making modifications to ensure that the layout of our entries is uniform throughout the database. Each group member has been assigned three plants to research and add to the database, which means that the database now contains 21 plants in total. For each one of these native plants we will include the common name(s), scientific name and family name, and a description of the anatomy and distinguishing features of the plant. We then discuss the uses of this plant, both medicinal and food related, in the aboriginal community and provide a few anecdotes or facts about it. Finally, we outline its geographical location and where it could be found in the Pacific Northwest and, if applicable, on campus. Our database is not yet available to LFS students but it will be soon! People will be able to access it through the LFS 350 flexible learning portal. We recommend the database be made available to all of UBC or the entire public, as this would increase the spread of knowledge. 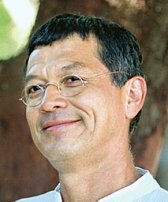 Community partner Dr. Eduardo Jovel has big ideas for our database. We believe that our ethnobotanical database is a good start for future LFS CBEL projects. We have discussed with Eduardo his plans for the IAH garden and the continuation of the database. 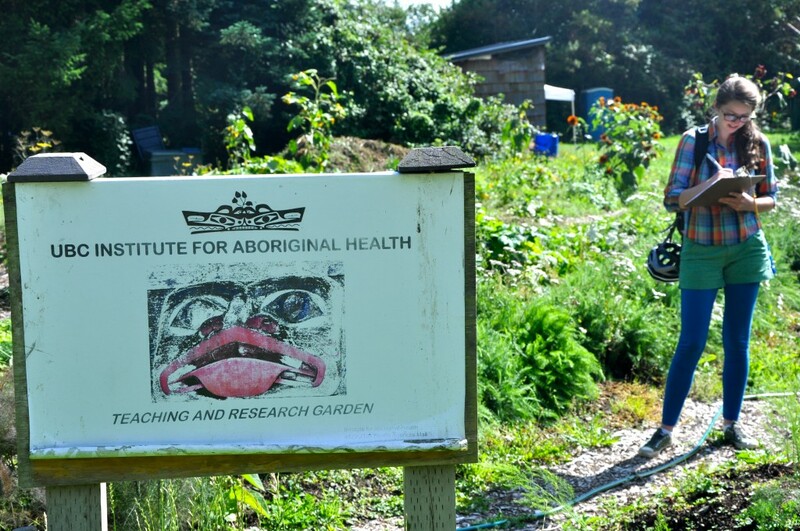 He has confirmed that the IAH garden will be incorporated into LFS because the Institute of Aboriginal Health is being absorbed under a larger Aboriginal umbrella and will no longer be running the garden. This “renovated” garden will have a much greater emphasis on education, veering away from the function of food production that currently dominates; we believe a balance between the two would be ideal. The plan is for the database to include a guided tour of the new garden and have in-depth information about the plants and their uses. We were discussing the possibility of students being able to scan a QR barcode with their phone at each plant to receive information specific to that plant. Our database is a great start to Eduardo’s new project and for students in future projects to build upon by adding more plants or more information about existing plants, perhaps with a virtual tour. One recommendation for future groups that might have a similar project is to get the Ethics Board approval for interviews before starting to work on the project. We believe that if we were able to conduct interviews, our database would be far more interesting. We could have included personal stories told by members of the Aboriginal communities and shared recipes and uses of native plants. We have simply collected information from different sources and compiled them in our database, because that was the only research method appropriate for our project. Adding qualitative research methods to our project would have given us the opportunity to provide our readers with new information and more relatable anecdotes and stories. Another recommendation for future groups is to take pictures of the plants they are planning on researching as early as possible. Unfortunately, when we were taking pictures most of the plants were no longer flowering or no longer had fruit because it was so late in the season; therefore many of the pictures did not demonstrate the distinguishing features the plants. Most of the photos used in our database were provided to us by the UBC Botanical Garden or found in the Wikimedia Commons, under creative commons copyrights. We believe that the database could be better if we took our own pictures of the native plants around the UBC campus. Some plants, roots mainly, are harvested in the spring before flowers — and sometimes even leaves — have formed, so being able to identify the plants at various stages would be helpful. Ideally, a picture of the plant during each season should be included; this way people could see how the appearance of the plant changes throughout the year. And finally, one of the most important recommendations is for students to get to know their community! Even though we could not interview people from our community, being able to meet them and learn more about them really helped us in our research. For example, attending community lunches, we were able to see how native plants could be incorporated into meals, which is what we ultimately want to impart through this database. We are looking forward to sharing our final findings and discuss our CBEL project with the LFS 350 class this week. We hope that they will enjoy this project as much as we did and that we will get constructive feedback and recommendations on how we could improve it in the future. 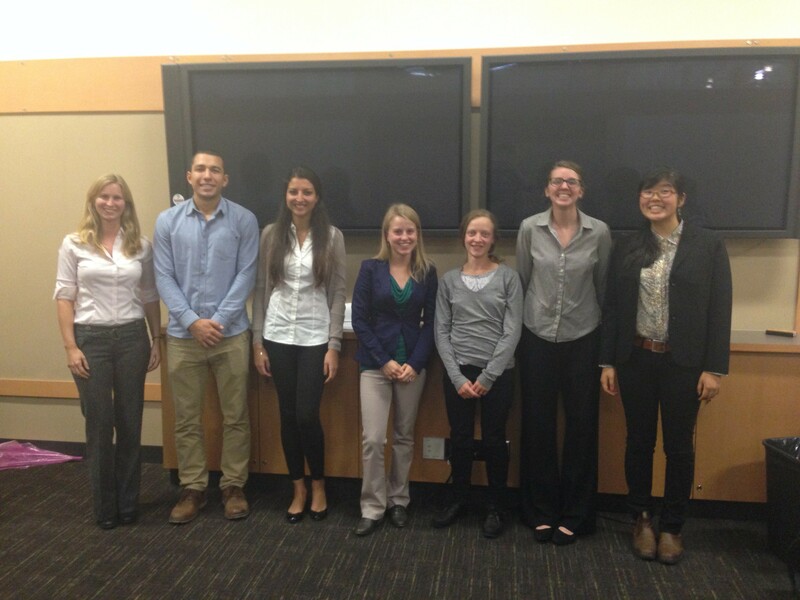 This week’s plenary presentation was definitely a success! We hope the majority of LFS 350 students managed to get an idea of what our CBEL process consisted of – it was quite a challenge to convey it in such a short time. We urge anyone with questions to leave a comment on our blog and we will get a response to you as soon as possible! Now that we have set definite headings to organize each of our plant posts, this week was mainly spent finalizing all of them, and tidying the database for consistency and organization. We have begun editing to ensure that there is identical formatting (bullet points, bold letters, italicized words, etc.) used throughout each page. Now every plant also has an accompanying image, most of which were obtained from Wiki Commons to avoid copyright issues, although of course they must be credited properly according to Creative Commons copyrights. Currently we are looking for an appropriate disclaimer to include, hopefully at the top of the database, warning readers to use caution or consult a doctor before ingesting any of the plants for themselves. We’re having trouble finding a way to integrate this into the website in an unobtrusive but consistent way. Although this warning is a necessity, it is yet another challenge for us to word the disclaimer in such a way that it does not discredit Aboriginal knowledge. As we have seen throughout the term and mentioned in previous blog posts, when working with Aboriginal knowledge we’ve made a conscious (and not always easy!) effort to be aware of the language that we choose to use (or avoid). As we start to wrap up, we are looking around and realizing that all of us are grateful to have had this opportunity to work with such an enthusiastic group of people, not to mention the chance to research Aboriginal plants that we may have not been familiar with previously. Despite not having a typical community visit, the events we attended such as the pipe-mix workshop, the FeastBowl, and the Botanical Garden during Applefest, are our fondest memories. Next week we will discuss our final recommendations. We are finding ourselves repeating that our greatest regret has been that we did not have sufficient time to obtain Ethics Board approval to interview Aboriginal community members and include first-hand information in our database. This would have required more involvement from the community, culture sharing, and building of relationships that would have benefited the database, the LFS students, and the community members. Furthermore, the current accessibility of the database is restricted to those involved with the project, or other LFS students and faculty. Although there may be reasoning for this that we are unaware of, the inaccessibility of this information to Aboriginal community members in general is problematic since the information that we have gathered originally came from those communities themselves. It also goes against what we have learned throughout this course, which emphasizes working with local community members. Next week marks our final week of class, during which we will have our final presentation in our breakout rooms. A few of our team members have been doing the bulk of the organizing of the presentation, while Saki prepares the Prezi that will be accompanying our presentation before she has to leave for Japan. 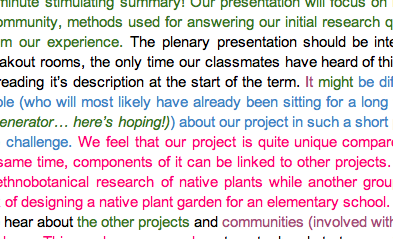 To reduce our upcoming final exam stress, we have also started to type our final project paper. EDIT: Check out the Digital Resources page for our final Prezi! The past two weeks, the bulk of our time has been spent on actually gathering information on the first plants we have chosen for our database, and starting to post them. Fortunately, between the books that we have borrowed and online sources, the information we need has, for the most part, not been difficult to find. Many of these sources contain an abundance of ethnobotanical information on the plants, which has been a great relief; given our restriction to published literature, we were worried that there wasn’t going to be enough information of the right kind. The only problems we have encountered involve which headings to use for the breakdown of the plant information. Originally, we had both “nutritional uses” and “medicinal uses”; however, after a group discussion we decided it may be better to group these two together, given that many people consider food as type of medicine. This is especially true within Aboriginal communities. We therefore dubbed it “Food and Medicinal Uses”. 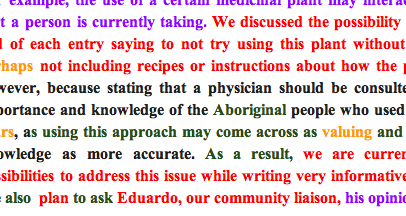 Eduardo then recommended we remove “Aboriginal Uses” from our list of headings because it would overlap so much with “Food and Medicinal Uses”. However, the goal of our research and database from the beginning has been to look specifically at Aboriginal usage, so we are being sure to include which groups used each plant and in what ways, when we discuss these uses. During our research, we have also found that many of the plants have unique stories or legends pertaining to their use or discovery, inspiring an “Interesting Points” heading. Another change we made is switching “Location in BC” to “Location in the Pacific Northwest”. This was because with plants, geographic boundaries are far more relevant than political borders. Once all of this data has been posted on the LFS website, all that remains are the upcoming in-class presentations as well as the final report. It is interesting to reflect on the challenge of working with titles and knowledge that surround Aboriginal communities. Although previously mentioned in our other blog posts, the constant vigilance to use proper terms and be culturally sensitive is an issue that may not be as pressing when working with an elementary school or a senior’s centre, and is therefore unique to our project. The fact that many Aboriginal cultures traditionally practice oral knowledge transfer, feeling that writing things down inhibits the adaptability and evolution of knowledge, further impresses this issue. This is part of our challenge in bringing traditional knowledge to media of a high-tech society, and without the ability to communicate with aboriginal community members we have had to make some assumptions and take some liberties, something with which we are not entirely comfortable. This week we will give our plenary presentation to the entire LFS 350 class; this will be a brief overview of our project. Saki and Laura are in charge of presentations, and will therefore be the primary presenters. They are tasked with condensing almost 3 months of work into a 3 minute stimulating summary! Our presentation will focus on briefly introducing our project and community, methods used for answering our initial research question, and what we’ve learned from our experience. The plenary presentation should be interesting because, outside of our breakout rooms, the only time our classmates have heard of this CBEL project was when they were reading it’s description at the start of the term. It might be difficult to engage a class of 200 people (who will most likely have already been sitting for a long time) about our project in such a short period of time, but we are up for the challenge. We feel that our project is quite unique, but at the same time components of it can be linked to other projects. For example, our project involved ethnobotanical research of native plants while another group in our breakout room had the task of designing a native plant garden for an elementary school. Of course we are also very eager to hear about the other projects and their community partners. Our group hopes to get a head start on our final written report this week, on top of preparing and giving the presentations. With finals just around the corner it would be nice to have it completed early. We are meeting with Eduardo at the end of the week to discuss the layout of our report. We hope to include a section of future recommendations for this project, as we will – sadly – be handing it off once the term is over. This week has been a different one for group 28! Instead of our usual group meetings and activity, we finalized our list of native and traditional plants and assigned two or three to each group member, and have been doing individual research. We are looking forward to meeting again to share and post our findings. The research process has been very interesting, with each of us becoming something of an expert on our assigned plants. As we have mentioned, one or two of our members have also taken courses that focused on Native plants, and though we can’t use their knowledge as a source, they have been able to recommend books that have been enormously helpful to our research. We are meeting on November 6th to discuss what we’ve found so far and to share what we’ve learned. We will begin with a brief discussion of the species information and ecology of the plant, with links to other databases for further information, such as E-Flora BC. We will then have a section containing medicinal and nutritional information about how Aboriginal peoples have used the plant and the different cultures’ diverse relationships with it. Then we will relay traditional stories about how the plants were used, or anecdotes that can be found in the literature. Finally, we will provide a list of locations where that plant can be found on campus, linked to a map if possible. We sense that the story section of the database would be more accurate if we could interview local First Nations people, an ethical and temporal limitation that has been frustration to us. This week’s e-lecture highlights the importance of community consultation and constantly listening and valuing local knowledge during intervention projects. We are struggling with the idea of completing our project without consulting any actual Aboriginal members of local communities beforehand. We are hoping that once this project is well established, more each item in our database can be supplemented through ongoing consultation directly with the First Nations community. Perhaps if the concept of Biocultural Diversity is indeed developed into a course, a stronger connection with the local First Nations communities could be established. Of course, the concept of Biocultural Diversity extends to all local communities, so extending the reach of the database will likely always remain a goal. Post #7 in the making. Molly Campbell, our TA, also brought a very important concern to our attention. Many of the plants in our database were used for medicinal purposes and we want to include these uses for our future readers. However, we need to be very careful about the content of our entries in order to avoid possible health issues resulting from the use of these plants by the public. For example, the processing of plants and dosage is information that could easily get lost in the various levels of communication intrinsic to academic sources, as opposed to primary sources. Furthermore, the use of a certain medicinal plant could interact negatively with medication that a person is currently taking. We discussed the possibility of adding a disclaimer at the end of each entry saying to not try using this plant without consulting a physician. It is difficult however, because this seems to de-legitimize the knowledge of the Aboriginal people who developed uses of these plants over thousands of years, and using this approach may come across as valuing western science and knowledge as more accurate. As a result, we are currently brainstorming different possibilities to address this issue while attempting to write very accurate entries about the plants. We plan to ask Eduardo, one of our community liaisons, his opinion on this matter. Lastly, we mentioned in our last blog post that our group would be attending the Feast Bowl that is organized by the IAH Garden; however, the lunch was unfortunately at the same time as our LFS 350 lecture this month and we therefore could not attend. We would like to attend one more Feast Bowl before the end of the term, but November’s event is the day of our final presentations, and December’s is, of course, during finals. Since the decision that the IAH Garden is to take less prominent of a role in our database we haven’t been in touch with our second community liaison Hannah as much, and hoped that the Feast Bowls would be a way to maintain this contact. However, we may find it more practical to simply meet with her to consult about general concerns that come up around our project. A home for our database! However, the biggest change in the past two weeks has been that our database is going to be expanded to include native plants found in the UBC Botanical Garden as well as those we have already been documenting in the IAH Garden, and possibly other gardens on campus if time permits. These two changes were largely made because there are very few plants present in the IAH Garden that fit our original criteria. These criteria are the outcome of the conversations Hannah initiated by challenging us to question how we define “traditional” plants; because we felt that non-native plants are generally well-documented, and we wanted to focus on preserving practices and diets that may be fading in memory, we had decided to limit ourselves to native species, and specifically those that are edible (as medicine or food, a distinction we are finding difficult to make), not realizing just how few of these are currently planted in the IAH Garden. The expansion to include edible native plants in the Botanical Garden will help open our scope. We managed to visit the Botanical Garden during the Apple Festival and snap some pictures for our project, but at this time of year the majority of plants are going into dormant states and don’t look much like they will in the spring and summer. Nonetheless, we have contacted the garden and they have offered to provide us with some of their own digital photographs of plants found in their Native Garden. Post #6 in the making. Further discussions over what constitutes traditional food and diet have included the thought that some of the First Nations of the pacific northwest practiced what could be called horticulture, tending to plants already growing, though not necessarily planting them themselves. We expect that this is a challenge for the IAH Garden, which cannot grow many regional traditional foods or medicinal plants, many of which simply do not take to cultivation on an agricultural scale, such as huckleberries. However, many people do harvest from native species growing in more natural ecological setting, which can actually be more successful; plants do best if they grow where they “want” to grow! Similar approaches to food harvesting have even earned some First Nations in this region recognition for cultivating shellfish (Clam Gardens: Aboriginal Mariculture on Canada’s West Coast by Judy Williams; http://www.timescolonist.com/news/local/1-000-year-old-first-nations-clam-gardens-unearthed-near-sidney-1.232161). Finally, in our latest meeting with Eduardo we discussed the idea of Biocultural Diversity on campus (i.e. the diversity of culture and of biological life, specifically at UBC, and the interactions between the two). Our database will help to spread this concept as it includes both ecological and cultural information. Eduardo mentioned the possibility of starting a course on Biocultural Diversity; if he does indeed pursue this, he suggested that he will use our database – which we think is pretty neat! We are beginning to realize that our CBEL project does indeed have a lot of purpose for our community members! Now that we have finally set a foundation for our database, our group discussed which traditional plants we wanted to include and we assigned two for each of us to research initially. A few examples are salmonberry, nodding onion, salal, and licorice fern. We hope that we will have time to complete more entries into the site, yet we do realize that we are creating the base for this project that future students can build on. Our group is also planning to visit the IAH garden for a second time, as well as attend the upcoming feast bowl on October 30th. Although our group has had a thorough understanding of what we would be doing for this project, we have been feeling a bit stuck for a while without knowing where the information that we were researching around the garden would be going. Fortunately, this week, some of our group members met with Eduardo, one of our community liaisons, and Duncan of the LFS Information Technology department. This meeting has finally allowed us to really start to dig into our project; we were finally given clear directions on what our community partner would like us to do and the format in which we can publish our work. The next step will be to assign native plants from the IAH garden to each one of our group members to thoroughly research medicinal, culinary and cultural uses. But first we must determine which plants are native! We expect this will require ongoing conversations with Hannah and others at the IAH, as we work. The database that we will be working on will be operating within the UBC Wiki. A wiki format is easy to use and involves very simple coding, so we will be able to focus on the content of our wiki entries rather than the formatting of the database itself. This is a relief to many of us since are aren’t incredibly tech-savvy, and we had discussed our concerns about the possibility that the format would obstruct our ability to use the database. An easy-to-use format will also make it much more possible for future LFS groups to further build the database. The information that will be posted in the Wiki will be embedded into a UBC website which can also host future LFS projects on the use of plants by other indigenous communities. Eduardo also showed us a few plant databases as examples of what we could do once we start posting on the website and how to format and organize our posts. These databases are interesting and helpful but are definitely more complex than ours will be. One of these was the E-flora BC plant identification database that was created by the Geography faculty here at UBC. It is very detailed, containing in-depth ecological information about the plants that we will be covering in our wiki, but no cultural information about the use of these plants. We will be linking the appropriate E-flora BC page that corresponds to the plant, in order to give the readers a link to all the ecological and descriptive characteristics of the plants, as well as the cultural use of the plants from our database. This means that our main research will mostly consist of how the Aboriginal communities in British Columbia use native plants for food and medicinal purposes, without going into details on the physical characteristics of the plants. By linking our database to others we hope to expand and create more connections within the existing network of botanical and ethnobotanical information that is already available. For all of our plant posts, we will be taking our own pictures of the plants in order to avoid copyright issues. We have discussed the idea that the cultural information surrounding the plants should be prioritized to be accessible for the Aboriginal community themselves, who have provided all the information that we are using, including what we obtain through secondary sources. Although it is not strictly stated in our instructions to do so, we are wondering how we can assure that this information will be accessible to the communities to which this knowledge belongs. We suggested this could be done through links to the UBC Wiki and LFS website on the UBC farm page, and letting local communities know about the database we are creating. Members of our group, or our community liaison Hannah, can pass on links to our database through the newsletters and listservs that go out to Aboriginal community members. 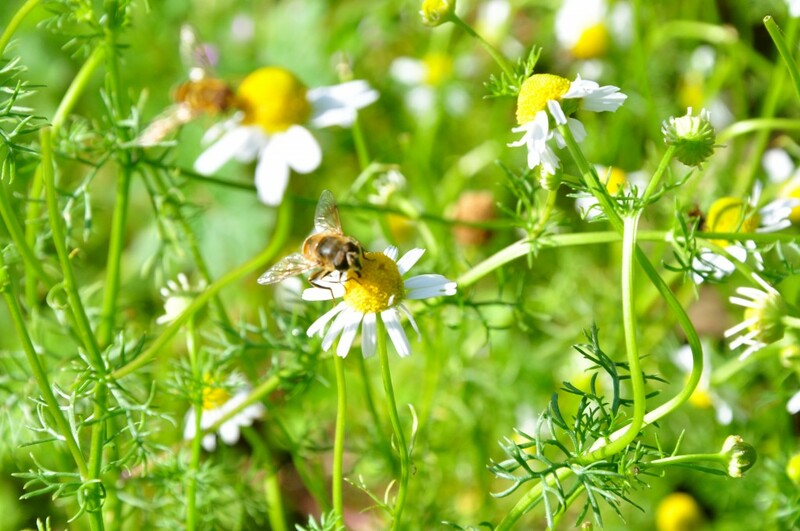 In the IAH Garden – chamomile? By next week we hope to have the first drafts of our research material about the native plants and their Aboriginal uses posted on our wiki page. This week we met with our community liaison, Dr. Eduardo Jovel, and also completed our project presentation and written proposal. Dr. Jovel recommended prioritizing our database to the Institute for Aboriginal Health (IAH) Garden, and the plants within it that are native to the area, due to time restraints with our project. This answers a question that has been a main source of discussion within our group; the majority of the plants that are grown in the garden are non-native species. To document the garden in its entirety would require including non-native plants, while documenting all native plants used by the IAH would have to include their wild-harvested plants. Dr. Jovel’s suggestion eases this choice, and also means that the direction that the database could take will still be left open after we’re done. He also recommended using scholarly sources for our research method to avoid the kinds of situations we encountered in “Student Researchers negotiating consent in northern aboriginal communities” (2006), where many students conducting research within Aboriginal communities encounter ethical dilemmas for which they are often unprepared. By sticking to literary research we can avoid a difficult situations, while still accessing some excellent compendiums of information from a wide variety of sources. As Dr. Jovel reminded us, what one interviewee tells us may not accurately represent the range of experiences and traditions that exist; therefore, it is safer to focus on scholarly research for now. Additionally, on Wednesday our group presented our CBEL project to our colleagues and our TA, Molly, explaining what we have determined for our project’s focus, research methods, research question and the vision for the database. We also shared our personal interests and reasoning for choosing this CBEL project as well as any concerns that we may have with executing the tasks. These ranged from interests in bringing often-overlooked traditional knowledge the attention it deserves, to contributing to the health of local Aboriginal communities, to the practical concern of ensuring that our database is presenting new and useful information, or more seriously, concerns about potential ethical dilemmas in the representation of these traditions. We found some shared interest among our classmates in the field of herbal medicine, which bodes well for the potential benefit that this database may have for future students. Molly’s feedback was helpful and fair. Lastly this week, we submitted our written group proposal for our project on Sunday. Overall, we are happy with the progress that we achieved this week and we can’t wait for what we‘re going to learn in the upcoming weeks. Preparing ingredients for the pipe mix. 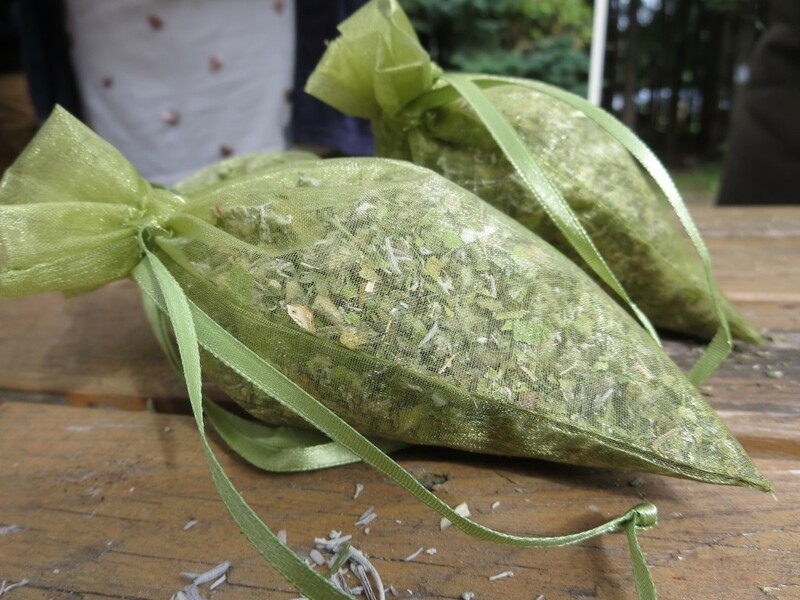 Finished sachets of medicinal herbs. Looking to next week, we hope to finally meet with Duncan, our IT help, which will hopefully shed light on the technicalities of the database, although we have been informed we have a site! We are still uncertain how much time the creating and editing process will take; the more complex it is the fewer plants we will be able to input. As we stated in our proposal presentation, we are focussing on creating a functional and easy-to-use database that is simple to build upon, rather than one filled with plenty of information but buggy and clustered. We will also need to begin researching our subject plants. We have obtained a few books to use as sources from Dr. Jovel and members of our group, but it’s expected that these alone will be insufficient. Our next steps include allocating plants to research individually, revisiting the IAH at the UBC Farm and confirming with our community partners which plants are considered traditional by the Aboriginal community. Davison, C.M., Brown, M., & Moffitt, P. (2006.) Student researchers negotiating consent in northern aboriginal communities. International Journal of Qualitative Methods, 5(2): 28-39. This week has been a very productive one for our group! In addition to visiting the Institute for Aboriginal Health (IAH) garden last week, where we took many photographs and made observations, we were able to attend one of the monthly Feast Bowls that the IAH organizes. The IAH is an institute that was designed in order to improve the health of the Aboriginal people in British Columbia and increase their participation in health careers. One of their goals is to promote indigenous health knowledge and support their traditional health care system. The Feast Bowls are a perfect example of the collaboration between Western knowledge and traditional Aboriginal health, where traditional foods from many communities are put together in order to improve the health of the Aboriginal people while incorporating foods from their traditional diet. Herbs fresh from the IAH Garden. Attending the Feast Bowl, we learned about the purpose of the IAH garden and got to know some of the people we will be working with. 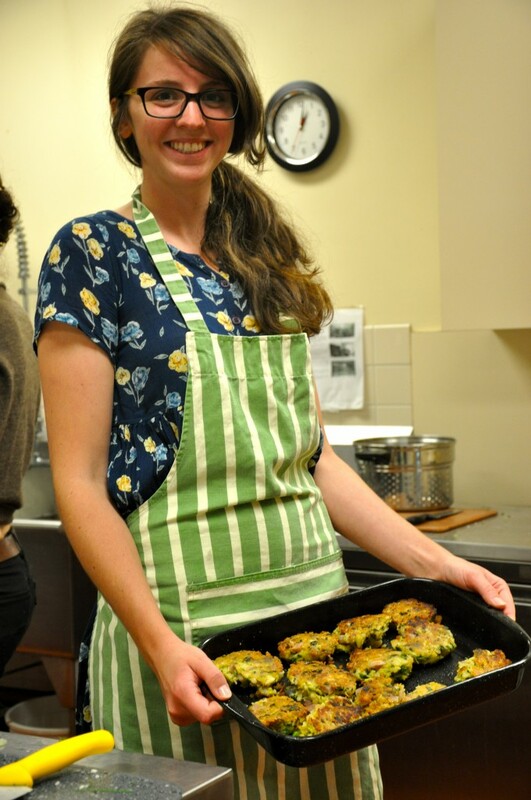 We helped prepare fish cakes, tzatziki, bannock, steamed vegetables, and an apple crisp. We were shown how to use sweet cicely instead of sugar to sweeten the crisp. Sweet cicely is a local herbaceous plant that is usually considered a weed but it makes an excellent sugar substitute, especially for those with or at risk of diabetes. Almost all of the ingredients used were gathered from the IAH garden, so they were organic, fresh and made for an exceptional meal. Fortunately, there were a lot of volunteers, so the food was prepared relatively quickly and served to the crowd of about 30 people. Before sitting down to eat, we all joined hands and a prayer was given in a First Nations language. This helped to remind us of how much goes into a meal and that not to take any of it for granted. We also took this opportunity to speak with Hannah Lewis regarding future options for our project, including the database and some of the plants from the IAH garden. 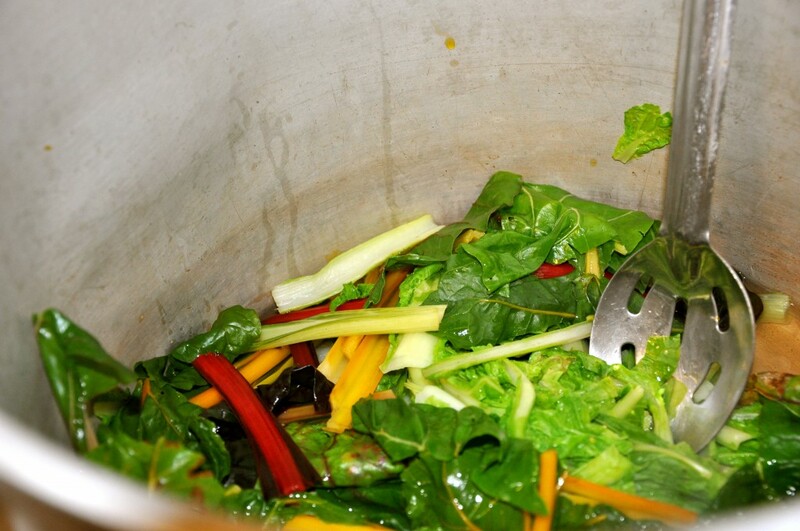 A rainbow of swiss chard blanching away. We have learned many things during our project so far. We realized a need to define the term “traditional”, as we will be using it over the course of our project. “Traditional” can have different meanings depending on the context, but overall, it can be defined as an inherited and established or customary pattern in the way of thinking or behaving, associated with a particular culture. It is also the handing down of information, beliefs and customs from one generation to the other. “Tradition” is most commonly defined as cultural continuity in social attitudes and customs, but traditions are not necessarily specific to one location or culture. To many people the word “traditional” can come across as “old-fashioned”, when in fact it is highly flexible, constantly adapting just as cultures do. Jen presents some of the amazing handmade fish-cakes. Aboriginal communities of the Pacific Northwest, including those that we will be working with, traditionally relied mostly on fishing, foraging, hunting and forms of horticulture for sustenance. However, the IAH garden largely grows a mixture of cultivated crops that were introduced to these Aboriginal communities mostly by Europeans and have since been incorporated into their traditional cuisine. There are also some native plant species in the garden, and more are harvested from the natural forest ecosystems. The cultivated crops and the native plant species are both incorporated in the Aboriginal community lunches. We look forward to seeing how the IAH garden promotes health through the use of food, which we expect will show a link between food and medicine. 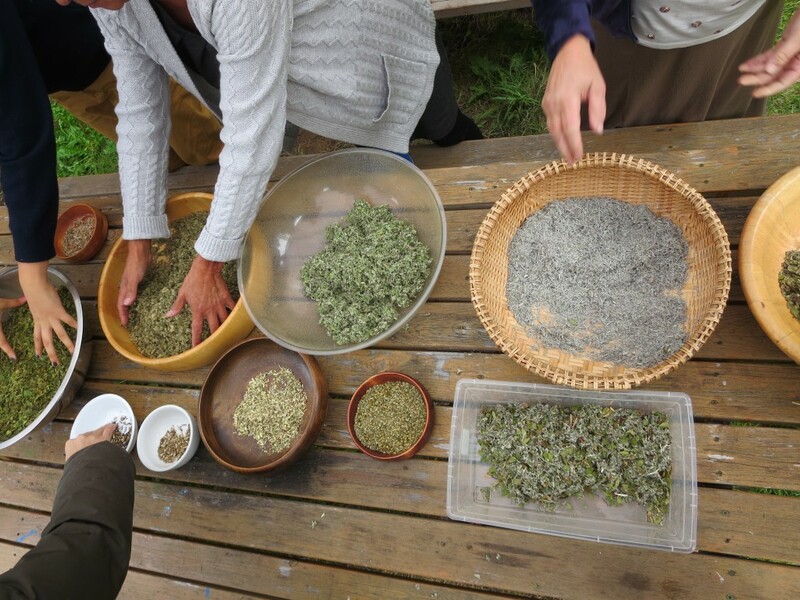 The Aboriginal populations in Canada have been using many major groups of plants as medicine, and through the IAH garden, this knowledge can be shared within the community by harvesting native plants and using them in the lunch program as well as for other means. We hope that our database will be able to spread this knowledge even further! The Truth and Reconciliation Commission (TRC) was first popularized by Nelson Mandela and Desmond Tutu in South Africa, as an early effort to resolve the former conflict that occurred in the country during the apartheid era. The TRC is a commission dedicated to uncovering truth in order to create reconciliation and move towards restoring and uniting a country. The Canadian TRC was established in June 2008 to come to terms with the atrocities forced on Aboriginal people in government- and church-run Residential Schools that operated from the early 1830s, with the last one closing in 1996. The TRC provides a platform where Aboriginal people can provide a testimony of what they went through in Residential Schools with the hope of healing former wounds. However, it is important to note that there is controversy over the said task of finding “the truth”; it could be argued that the TRC might instead reopen many wounds, instead of healing them. The TRC is hosting a national event in Vancouver from September 18th to 21st. As UBC students, we were impressed that the university suspended classes on September 18th to encourage students to attend the national event. Those who attended heard many stories from courageous Aboriginal individuals who chose to speak up and talk about the mistreatment that they were forced to endure. Sexual, emotional, mental and physical assault were common themes of the experiences of the Residential Schools, which tried to assimilate First Nations individuals into the same culture that had made their traditional ways of living impossible. The effects of abuse and neglect that the survivors experienced have often had consequences that have lasted intergenerationally, with the legacy of residential schools still present in many families and communities today. We have been horrified to hear what Aboriginal people went through at the hands of our own government and institutions, and we cannot even fathom the weight held on their shoulders as a result. Yet the resiliency that we saw was remarkable, and sadly something that is often overlooked regarding First Nations communities. It is important to note that the TRC is only the initial step, not the end process. One Aboriginal woman at the event on Wednesday stated that although she’s very appreciative of the efforts to put on the TRC event and raise these visceral issues, the government pushes many of these reconciliation responsibilities upon First Nations people. As this woman eloquently stated, reconciliation is not something to be forced upon people. This raises some serious questions: is the Canadian government carrying out the TRC to simply “save face”? What has the current government been doing to actually improve relationships with Indigenous people today? Whatever the answers, we feel that these initial steps made by the TRC are indeed necessary so that Canadians can come to terms with the atrocities in our past that occurred towards Aboriginal people. However, there is a long road ahead, which Canadians need to be aware of so that First Nations individuals can feel supported and safe during this delicate process. Whether or not UBC’s suspension of classes was effective in this intention is debatable. Many students that we spoke with did not seem to know, much less understand, why it was that we didn’t have class on the 18th. British Columbia is a distinctively multicultural province, and many international students who study here have come from countries where groups have suffered similar atrocities. Would these students then be permitted to not attend class, and not suffer any consequences, if they chose to commemorate a day that was meaningful in their home country? We hope that the university’s suspension of classes fulfilled the need to renew awareness of these events to the next generation of Canadians, and we are appreciative of instructors who took time to bring the issues into their classes. … to the blog for Group 28, which will be developing a Digital Ethnobotany of Traditional Food Plants, at the Aboriginal Teaching and Research Garden at UBC Farm. Our group will be working here for our Community Service Learning Project. We will be assisting in the creation of a digital ethnobotany of traditional food plants that are found in the garden. The members of our group are Jen, Laura, Ava, Saki, Hayley, Zineb and Nathan and we come from various backgrounds including APBI, Anthropology and GRS. We have divided our tasks as follows: Jen is our liaison with the community partner, and is currently contacting them to find out more about our next move. Hayley is in charge of within-group communications (such as the creation of shared Google documents), as well as photography (for the blog and potentially for the ethnobotany database). Zineb and Nathan will be writing drafts of our blog posts, which will be discussed by everyone so we make sure to include all information and perspectives. Ava will administrate the blog, ensuring that posts are on time, fulfill criteria, and are well-presented. Saki and Laura will be in charge of our presentations throughout the term. The actual legwork of doing research and creating the digital ethnobotany collection will be shared amongst everyone. We are each very interested in this particular project because we are eager to know more about the use of locally-native plants as food, medicine and preventative methods against common diseases. We are also interested in the social side of the project, which consists of interacting with the UBC Farm community and the Aboriginal community. We are looking forward to creating a platform for Aboriginal individuals to share their knowledge. We hope that our project will make a connection to things learned in LFS 250, which highlighted the differences between fast knowledge and slow knowledge, where our project consists of making the slow knowledge of the elders available to the public through fast knowledge. Our group is very diverse and many of us have skills that will help us with this project. One of our members has a degree in anthropology and sociology, which can help us with the social and intercultural aspect of this project. 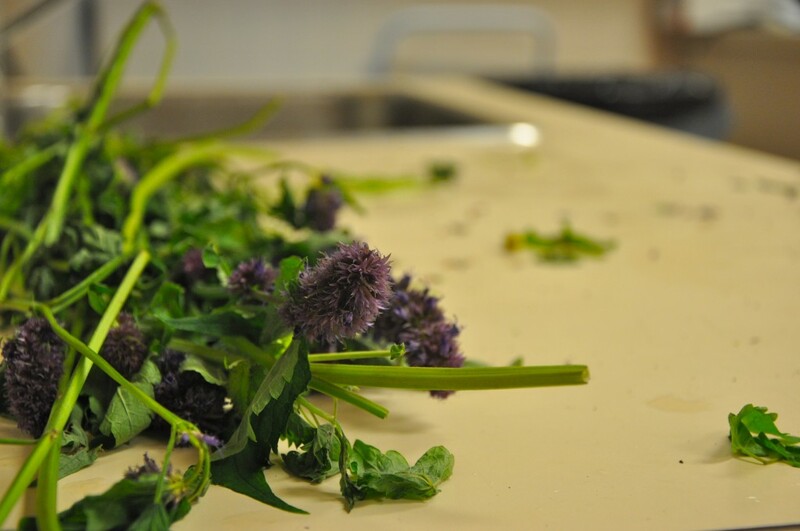 A few of us have also taken a medicinal herbs class or independently studied edible west coast plants, which will help not only with the identification of plants, but also with the labeling and descriptions that we will be working with. One of our group members has also taken an Aboriginal Forestry class, in which one of the components was highlighting the importance of medicinal herbs in the lives of First Nations individuals in Canada. We are very excited to have been assigned this project and are already exploring ways that we can create a database that will share the valuable knowledge of the Aboriginal community!